Saudi Arabia’s Embassy in Iran after protesters stormed the premises and set it on fire. Saudi Arabia has given Iranian diplomats 48 hours to leave the country and has severed all diplomatic ties with Iran less than a day after Iranian protesters attacked the Saudi Arabian embassy in Tehran. In an announcement on live television, Saudi Foreign Minister Adel al-Jubeir also announced that Saudi diplomats in Iran had been evacuated and were on their way back to the Kingdom. “We are determined not to allow Iran to undermine our security,” said al-Jubeir on television. Tensions between Saudi Arabia and Iran flared after Saudi Arabia’s Interior Ministry announced the execution of 47 people, including influential Shiite Sheikh Al-Nimr. Protests against Saudi Arabia’s actions erupted in Yemen, Pakistan, Bahrain, and Iraq. In Lebanon, Hezbollah said the execution of Sheikh Al-Nimr was an “assassination” and called the move a “grave mistake”. Hassan Nasrallah, the leader of Lebanon’s Shiite Hezbollah movement, accused Saudi Arabia of seeking to ignite a civil war in the region and warned that the blood of Sheikh Al-Nimr would “plague the Al-Saud [ruling family] until the Day of Judgement”. In Tehran, large groups of protesters stormed and torched part of the Saudi Arabian embassy, with police intervening hours later. 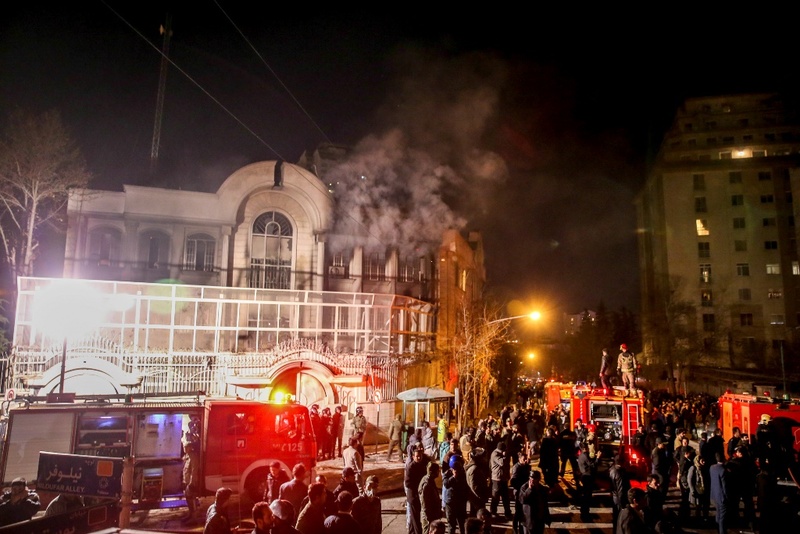 Elsewhere in Iran, the Saudi Consulate in the the city of Mashhad was also attacked by a group connected to Iran’s Elite Revolutionary Guards. Iranian President Hassan Rouhani condemned the attack on the Saudi Arabian embassy and ordered the arrest and prosecution of all those involved. However, hours after Iran’s President’s statements, Iran’s Supreme Leader Ayatollah Ali Khamenei warned that Saudi Arabia would face “divine revenge” for the execution of Sheikh Al-Nimr, calling Al-Nimr a “martyr”. Reports indicate Iran also changed the name of the street on which the Saudi embassy is located to “Sheikh Al-Nimr”. Saudi Arabia and Iran have been engaged in a proxy war in Syria and Yemen, supporting opposing sides. The two countries have also had strained ties over Iran’s nuclear program, with Saudi Arabia denouncing the United States’ deal with Tehran earlier in 2015.